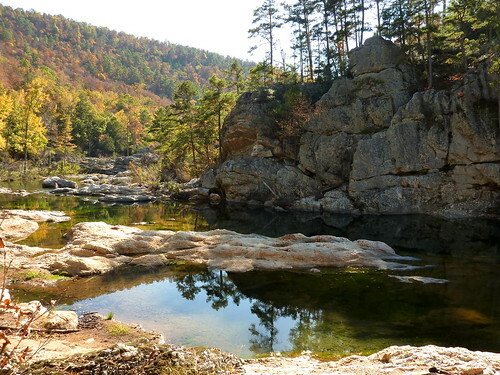 I have a new favorite trail in Arkansas as of today – the Winding Stairs Trail at the Albert Pike Recreation Area 60 miles west of Hot Springs. It is a lovely trail, although the nearby camping areas are shuttered after many tragic deaths there earlier this year. Yesterday was our fall inservice day. Afterwards I checked on a friend in Tulsa who had just been released from the hospital and then drove on to Ft. Smith, where I spent the night at the low-budget Baymont Inn, listening to the nearby roar of trucks down I-540. This morning began with the typical waffles and cereal at the inn, and then I asked Trixie the GPS app to steer me to Albert Pike RA. True to her name, Trixie decided we should not go the obvious route down I-540/US 71, but instead steered me eastward to the faster highways in Oklahoma. Since I wanted to hit the trail as early as possible, I consented to travel yet again through Poteau and Heavener before turning back east in the Ouachita Mountains. Then Trixie played another game, choosing to lead me on the north side of the forest, rather than looping around to the south. I later discovered that meant that I had exchanged paved highways all the way to Albert Pike RA for highways followed by a 12-mile drive down a gravel one-lane forest road to my destination. I truly did not mind, enjoying the backwoods and being somewhat startled when asphalt returned as I entered Albert Pike. Much of it was roped off since the Forest Service has closed the campgrounds after the terrible flash flood of the early hours of June 11, 2010. The flood rapidly submerged the campground under 23 feet of water and, although dozens of campers were rescued, about 20 lost their lives. Understandably the area is now only a day use facility. I crossed the Little Missouri River and drove on a rough gravel road up over a mountain to reach the trailhead, where I found two other vehicles and set out on the hike. Soon I reached Blaylock Creek, where a wooden footbridge was swept away in a past flood, leaving only a timber piling out on a bar in the middle of the creek, next to an enormous boulder. With the help of my trekking poles I balanced on rocks out to the bar, finding a shred of blue material stuck to it which served as a sad reminder of how workers found bodies and shredded clothing up in the trees above the Little Missouri after the recent flood. I shook off the mood and enjoyed the pretty rippling water, settling down to eat a turkey sandwich I had bought back in Ft. Smith. Soon a deer forded the creek upstream of me, and then a high school age couple forded the creek by me, saying they were enjoying a day off from school. So was I, and I was glad to see some people, although I would not see another soul for the rest of the five-hour 8.5-mile trek. It wasn’t hard to spot the recent flood damage, including some uprooted trees beside the trail. But their surviving brethren, towering above me and around me, lifted my spirits. No such luck for the autumn leaves, however, which cascaded down around me whenever a gust blew. No flowers had made it this far into October, although I did spy some berries. I passed by a towering triple-trunk tree which sported lovers’ initials. Then the trail wound down to the Little Missouri River, offering a nice view of a nearby mountain with its rock ridges. This area of the riverbed was peppered with boulders and colorful rock formations, and I posed for a self-portrait. The trail rapidly ascended to a bluffline, along which I spotted two turtles out in the middle of the river far below, but my superzoom camera brought them closer. Then the trail slowly descended back to the riverbed, where I saw leaves running the tiny rapids just upstream of where I would finally have to ford the Little Missouri. Flood damage made it hard to follow the trail here, and on the first pass I missed the double blaze indicating the ford, traipsing on to where a side stream had chiseled out the rock. But soon the trail faded away and I realized I had missed the ford, and backtracked. I wandered along the shore, trying to find a spot where a series of rocks and much support from my trekking poles might allow me to avoid dunking my feet. I finally picked a spot and managed to fully immerse my left foot, although on the return journey I improved and stayed completely dry. Thankfully it was a warm sunny day and my boot and sock dried rapidly. This portion of the river was particularly beautiful, with a large bluff on one side and small falls in the riverbed and a panoramic view upstream. Further downstream it was still quite beautiful and panoramic. Then a very pretty side creek called Raven Branch joined the river near some large formations. On my return trip I ventured up this rocky creek, finding a wonderfully cool and scenic fall and pool where I lounged for a bit. I was tempted to follow the example of a nearby tree and take a sip and join its leaves in the whirlpool. The trail ascended to a deep moss-covered overhang and then joined the Viles Branch Equestrian Trail. Part of this area was particularly flood-ravaged, requiring extensive clearing since last June. Several armadillos were grubbing around the area. The trail wound onward, finally ending at Musgrove Hole, where I climbed to a rope tree swing. Having never succeeded with the hanging rope in junior high gym class, I did not actually try to use it. I wandered along the rocky south shore of Musgrove Hole and came across the first all-terrain-vehicle tracks of the hike. Sure enough, an ATV road lead away south. In my wanderings I’d stretched a 3.6 mile hike to five miles. It was time to reverse course and, although I prefer loop trails, it was nice to review all of the sites along the Winding Stairs Trail. When I reached my car it was alone at the trailhead, having the spent the time gathering a leaf collection. After a quick torso wash and changing my shirt, socks, and shoes, I drove 1.5 hours east to Hot Springs and checked into my tiny room at the old Park Hotel across the street from the national park’s Grand Promenade. I was beat, so I took advantage of their 20% entree discount at the Angels in the Park Italian restaurant off the lobby. Still thirsty after dinner and finding the hotel’s vending machine out of service, I strolled downtown to buy a Sprite and then returned to my room for hours of photo editing, posting, and blogging. I interrupted the effort with a trip to my room’s tiny shower, which was just as cramped and feature-free as the one in my parent’s one-bedroom vacation home off Table Rock Lake when I was growing up. Some memories need not be revived. Tomorrow I’ll probably start with a trip to a McDonald’s for breakfast and spend the day hiking at Lake Ouachita. Click here for a photo slideshow from today’s hike. See the video from today’s hike.